In September I didn’t do a 30 day challenge because, frankly, I had a lot of work that I really needed to crunch through at the Googleplex and I didn’t have much spare time. But October is a new month, and so it’s time for a new 30 day challenge. For October, I’m not going to use any Microsoft software. No Microsoft operating systems (WinXP, Vista, or Windows 7) and no Microsoft Office allowed. I will continue to use their keyboards, because they make very nice keyboards, and I will allow myself to use their websites–sometimes I need to do a query on Bing to test how well they do, for example. I don’t plan to switch to Apple, although I might try a Mac for a week. Apple products are polished and usable, so why not switch to Apple? That would be a much longer blog post. Apple makes great design decisions for the majority of people, but if you don’t like a particular decision, it can be very difficult to change it. Have you ever wanted to see the exact time (including seconds) on an iPhone? It’s hard to do, and I’m that kind of guy. Another big reason is just that I’m huge believe in free and open-source software, and I want to support that sort of software. What have I learned so far? The current version of Ubuntu (called “Jaunty Jackalope”) is really quite nice. There’s a lot of polish to the UI and the day-to-day tasks work very smoothly. At the same time, it’s possible to tinker around with something so much (I’m thinking about fonts right now) that you mess things up. But the dev version of Chrome for Linux has been really fast and stable, even though Chrome for Linux isn’t officially supported yet. I spend a large chunk of each day in a web browser, so having Chrome as an option was critical. You should try karmic Koala it’s quite stable, and Openoffice 3.1 is a big improvement vs 3.0 in Jaunty. Did you have any trouble with network drivers? Thats the one thing about Ubuntu that I keep having issues with. If I could find a one click solution to getting my network drivers working, i would switch over all my machines. Good luck! Yep, that is a slick keyboard. hmmmmm, everything seems feasible, but how will you live w/o Outlook? This challenge is sure easier then it would have been a few years ago. Ubuntu is great and there are so many web based options now that you really don’t need Microsoft any more. I think it’s just that they are there so we use them. I hate open office, that is the only thing we can use on ubuntu i guess, why did you choose ubuntu ? I know exactly what you’re talking about with Mac vs. Linux. I need the little extras in Linux like focus-follow-mouse, select to copy, and middle-click paste. Make sure you take a look at Compiz-Fusion for better window and workstation management. Is this just a home thing? Or is it possible to be MS free at the Googleplex? I guess you won’t be getting much use out of several keys on that Microsoft keyboard this month. Matthieu, I *love* the Evoluent VerticalMouse. Just start learn a foreign language and you’ll never give up Windows, as almost all major dictionaries and courses are released in Windows version only. I am all for supporting you on this one! Oh how I would love to see everyone turn to Linux. Maybe by you doing so you will be able to convince some of your followers to do the same. I’m about to do a brain transplant on my laptop (new disk drive) with Ubuntu 9.1 beta which I’ve been hearing great things about.. I’m hoping to put what MS sw I need in wine,,, we will see, Access in particular may be a challenge, but I have some legacy stuff I have to do with it. But I’ll still have my other disk drive with Vista to swap out if needed. At our company IntegraScan we’ve switched everything over to Linux for our machines and web based for (most) of our software needs. Since then we’ve all fallen in love with Google Docs. The switch has taken a little getting used to but it hasn’t been that difficult. Without a doubt we’ve experienced far fewer problems which has translated in to an increase in profit. That’s because of the fact we don’t experience the tech bills we’d have every month when we were using M$. For the home or casual user a withdrawal from M$ might be too much to ask but for businesses I can say without a doubt Linux + Google Docs = More Profit. A really, really good decision! Make sure you try Amarok while you’re at it. It’s one of the few non-developer apps in Linux which I think is far superior than (not only equivalent to) any of its proprietary counterparts. I’ve been microsoft free for years. I use a combination of Mac OS X & Ubuntu. I could pretty much do without Mac OS X if I had to. My only major issue would be photoshop & lightroom, i know how to use the gimp, but it takes me forever and a day to accomplish the same thing on gimp than it would in lightroom. As far as mail and office productivity, I switched everything to the cloud years ago and am not looking back anytime soon. Good luck matt! Too easy, Matt! I have been Microsoft free since … Now that I think about it, the only time in my 25+ years of computing experience I was ever NOT Microsoft-free was when I was attending vocational school in Alaska to become an IT Pro (whatever that is) and Windows was required on my school PC. Then, I struggled mightily to wrap my head around the twisted disfunctionality of Windows and I was relieved when I could wipe the hard drive and load an OS that stays out of my way. (Note, I had never before had a WORK computer with Windows, either, so it really was something new to me. I’ll not miss that constant feeling of frustration every time I try to do something on my computer.) I can proudly claim that I have never had a Microsoft product installed my personal computer. Ever. I recently made the decision to ditch Vista completely, for several reasons which I blogged about. So far, I have zero regrets. And zero interest in Windows 7. Open Source is where it’s at, and from now on I’m putting my money into it, not into proprietary systems that spend development effort on lock-in instead of fixing bugs. Matt, is that your home office setup? I ask because I also use banquet tables for my office set up too. Mostly because I am cheap, but also because they are at the right height and have tons of leg room. well, my “30 day” challenge begun when my windows completely crashed a millionth time and I lost some data again … that was the day when I installed Linux and has never left it since. All joking aside, it is possible to not use Microsoft, but why?? You DID backup your Windows XP laptop didn’t you? Any difficulty finding device drivers? “For October, I’m not going to use any Microsoft software. No Microsoft operating systems (WinXP, Vista, or Windows 7) and no Microsoft Office allowed. I will continue to use their keyboards, because they make very nice keyboards, and I will allow myself to use their websites–sometimes I need to do a query on Bing to test how well they do, for example”. I don’t agree. Windows XP is good enough on my computer and Windows Vista on my Laptop. Office is also sometimes good enough. You can do Non-linear optimaization in Excel. My favourite platform is C++ Builder. Can GoogleBOT read and index contents in PDF documents? -sooo many other good, stable web app for (almost) any thing you can want to do. hypothetically speaking using bing for ‘reverse engineering’ is against TOS… because you work for competitor that is definitely against TOS. Please post your thoughts (good, bad *and* uncertain – we love constructive feedback!) and make use of ubuntuforums.org – it’s a great resource. Pfft. I fart in your general direction. I’m Microsoft free for four years this month. I mean 4 years ago. I just want to know the basis behind “how well Bing does”. What is the relative measure? Google itself? What if Google happens to be the one that doesn’t measure up in relative terms for a particular query? I remember my time fondly when I was working for a University in the UK, didn’t have to use Microsoft software for weeks at a time. Damn I hate Microsoft. I use crunchbang which is basically Ubuntu with the OpenBox desktop. I won’t use a Linux desktop anymore without “Sharp Fonts” (http://sharpfonts.com). Have you considered trying the Kinesis Advantage? You might find that, although the MS keyboards are nice, they’re not quite as nice as they could be. Love the idea – it would force a change which is always good! then to allow those who prefer an alternative to be able to stay with it. I run the IT so I know we could do it and that I would be supported! We would possibly be the first legal / patent attorney firm to make the change. One problem is that we have corporate DBs which only run on MSSQL – do you have any suggestions on how to get around that? Good Luck!! !i Linux is very good… try Debian five, is very good O.S. You’re a brave man. I wish I could do something like that. I use a CRM software called ACT! that only runs on windows. I use it all day long for two different businesses and it’s the lifeblood of keeping up with my current clients, prospect and all my database management. Recently I put Fedora on one of my servers (on a virgin HDD) and like you, I was pleasantly surprised with the polish of it. Additionally, it loaded drivers for everything and it all worked. But, no ACT! there either. I hate it that one piece of SW dictates my HW options! Is there a chance the 30-day trial will turn permanent? I think instead of “30 day challenge – No Microsoft Software” people should go for “30 day challenge – No Microsoft Hatred” and concentrate more on their work. I am sure soon you would come across lots and lots of software which do not support any other operating system other then good old windows if you are not using your system only for net. Matt – that is a great thing to do to get out of your box for sure! I recently got rid of all my pc’s and switched everything over to (laptop, desktop and phone) Apple. I go through withdrawals daily. They are not as strong as they used to be 😉 It is definitely tough, but I am learning new things daily which is nice. Good luck!! Let’s just boycott some of the best products in the world because google doesn’t like them. Seems like Matt loves the open source stuff (Free stuff). Hey great idea, why don’t we make adwords free just like all of the other open source stuff? I made the jump a couple of months back and have been loving it! Ubuntu is getting better all the time and it’s also getting very slick. I haven’t used Windows for ages now. Matt,You’re a brave man,good luck with your challenge! I tried something similar with a new computer I built recently. I decided to do a dual-boot between the windows7 RC and Ubuntu (Hardy Heron) and see which one I ended up using more. I loved the Ubuntu Interface, compatibility, easy of use, and shell manager. Even though I would consider windows7 to be more “polished,” I definitely felt that Unbuntu was a more “useful” platform. However, the fact that the adobe suite (photoshop and flash especially) doesn’t run on linux drove me back to win7, and I haven’t really been using ubuntu since, which is a shame because I love the way that it easily interfaces with remote servers. I’ve had Jaunty on my main desktop and Mint on my laptop for almost a couple of months now. It hasn’t been all roses … things you’re used to have “working” on Windoze well … don’t (the reverse applies as well, but I was just used to dealing w/ Windozes` quirks more). I have to tell you I am 95% happy and excited about Ubuntu/Gnome/Compiz. Mint is very nice as well, and I may eventually adopt that distribution on my main (I’m not all about the “hippie” movement .. and i HATE brown!). 5. Still have some pulseaudio issues, but I didn’t want to remove it and go the ESD route, I think my crappy onboard Intel needs to be upgraded to an X-Fi. You can’t trust Intel for Sound and Video. I just ditched Microsoft products last week for Ubuntu 9.04. It took a little longer to get a system set up with everything I needed, but as a bonus, my Microsoft Arc Mouse works perfectly now. Under Vista, the scroll wheel would stop working after several minutes of use. I am switching back to Windows after 4 years without it. Its much easier to run ubuntu in windows than vice versa. Over the weekend I downloaded an iso of Ubuntu 9.10 to boot from cd to try it out. I had to make some tweaks to the router and display settings and I have been playing around with it. Not much so far just surfing the web, but there is a bunch of apps I want to try. I have a spare pc so i might load it on to the HD later if it works out. Things seem to have come a long way since I last gave Linux a shot.. not good, way too many hardware and software compatibilty issues. I have another distro I might try later. I just have too many apps that would only run on windows, so all being well, dual boot would be the way to go for me. Using Linux right now in fact to write this post.! I haven’t missed a week (probably a day) using MS software in over 20 years. I would probably have withdrawals! Looks like an easy one! Microsoft escape is a nice try, but now i see on this pic of your work setup that this does not seem an ergonomic environment! 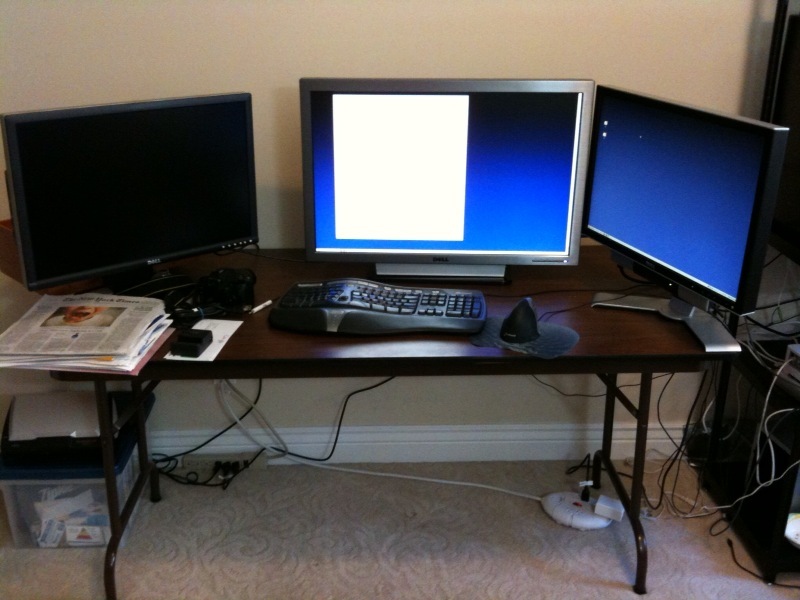 It mostly depends on your height and on your chair’s height, but the keyboard should be placed a little lower from those big monitors (example: on my desk i’ve installed a lower shelf for keyboard and mouse). If you’re not a big PC gamer or graphics artist, there’s no reason whatsoever why you shouldn’t run 100% of your computing on Ubuntu. I’ve had an office machine, a laptop, and an aging mom on ubuntu for 2 years now with much fewer problems than I would have had if all machines were on Windows– can you imagine the spyware and viruses? Other than games and photoshop, there is no compelling reason at all to run Windows. I am a big gamer so my “main” machine is windows7 which I actually like quite a lot, but for any machine I actually do work on I’m running ubuntu only. but just dont overdo and overhype it…also be sure that nobody is behind you..you r alone. OH wait, no Apple for my whole life. Win! Actually, it’s not very difficult to go Microsoft-free for 30 days – just like it’s not difficult to go Google-free for 30 days either. The reality is that with very few exceptions, the market today is filled with alternatives for just about everything. This is of course a *good* thing for us consumers. The question than really is – Which product choice fits your needs the best? Would you voluntarily cripple yourself to use an inferior option if viable superior alternatives are available? Of course, what is deemed inferior and superior is subjective for everyone. Yeah…very nice microsoft keyboard, Matt. Whatever, I am waiting for Google Chrome OS next year (2010), much faster would be very much better. wow. is that really your home “office”? dude, at least go to ikea and get a desk that has variable height to protect your shoulders and wrists 🙂 There’s no office chair that will get you high enough to get out of T-Rex mode. btw, though many microsquash products are bloat-ware, I really have to say that Excel is my favorite piece of software of all time. it’s so flexible. Those people probably thought they were building finance software. hah. In retail, everybody uses it for product data. When you have 50,000 lines to proof, you don’t do it in a web interface, you export to excel, proof and then upload your corrections. super flexible. awesome. SnagIt (SnagIt 8 specifically since they borked it up with SnagIt 9) is my number 2 software and it’s the main reason I won’t move off of Windows anytime soon. Good luck! I just would not have any idea where to start and what to give up. It seems like Microsoft is my business partner, just like my landlord! I’ve been playing with Ubuntu for some time now, and I agree, it is a good, stable and easy to use OS. Good luck with the challenge Matt! I’ve been MS free for 29 years since buying my first computer in 1980 before the IBM-PC was introduced. I did purchase a version of Office for the Mac about five years ago, but since Apple came out with Pages, Numbers and Keynote, I have no reason to use the Office apps anymore. My wife of 12 years has always been a Microsoft person, but her next computer will be a Mac. I knew you are going to switch to Linux one day. I think after 30 day’s you are going to stick with it and make Windows xp, 7 as VM. Good luck my friend, let me know if you have questions about Ubuntu am always happy to help. I’d like to propose a counter 30-day Challenge for October: No Google Anything. After a while, you start wanting to turn everything into a Linux box. I have a jailbroken Iphone with an Ubuntu theme on it now, and I swear I have started wearing muted earth tones. 30 day challenge for October: No Microsoft Software……………………I will continue to use their keyboards, because they make very nice keyboards, and I will allow myself to use their websites–sometimes I need to do a query on Bing to test how well they do, for example. So you’ve failed before you even started. Curious, if you had a seminar to give this month, what would you use in place of Powerpoint? I hear you Matt. I have been running Ubuntu for a couple of years on Virtual Box on top of XP. I love Open Source and would love to make a full time jump to it. But in the web design business it’s tough to go completely Open Source due to graphic design needs and cross-browser testing issues. Code Weavers and Wine just don’t function well enough in my opinion to make them a reliable option for the majority of apps out there. So I compromised and got myself a Mac recently. I get to run XP on Parallels (for the few Windows apps I still use) and Ubuntu for fun. With the Mac, all my Adobe and commercial software needs get taken care of. Plus, I can still play around in the Bash and have access to all of the cool free tools that open source has built up over the years–vi, emacs, Python, Perl, etc. Macs certainly aren’t perfect but they seem to straddle the line between commercial and open source better than any other OS at this point in time (in my opinion). I can give you a litany of things I dislike about Apple, and I’ve had a Mac for 3 years. My biggest one, Quicktime won’t remember the volume setting you last used and ALWAYS starts with the volume maximized. It’s the ONLY video player I know of that does that. And the update of the Quicktime player that came with Snow Leopard… fuggedaboutit. I’ve pretty much switched to using VLC exclusively. The more I find myself running FLOSS apps on Mac rather than the “it just doesn’t work the way I want it to” apps that come with the Mac, the more I wonder if my next system will just run Linux. good choice ! all the best ! Just as well I read the comments – just ordered a VerticalMouse 🙂 Actually (no laughing, k?) never heard of it until 15 mins ago. Matt, I don’t care what you use on your desktop OS but that physical desk has got to go! You can see all the tangly bits and you have monitors dripping off the side. You gotta do the no social media next. I bet nothing will change other than you will be a LOT more productive. You’ll lean back towards email as well. Ubuntu works great. Thusfar, Google Docs has met my limited requirements for “office” software. Have fun! If you’re not a big PC gamer or graphics artist, there’s no reason whatsoever why you shouldn’t run 100% of your computing on Ubuntu. Classic ASP comes to mind (yes, there’s ChiliSoft ASP, but it’s not the same.) DotNet probably does as well (I’m not sure on that…I only just started learning ASP.net four months ago). Yes, there’s PHP, Perl, Python, etc….but personally, I prefer a language that reads somewhat like “the Queen’s English”. I will, however, respect your point of view on language/framework(s) as long as you respect mine. By the way, why do a bunch of you have “software” confused with “all Microsoft products”? Matt didn’t say he was giving up on all MS products completely…he just said the software. He didn’t say the hardware. He didn’t say Bing. In fact, he made a point of stressing the opposite. This is a pretty straightforward post. Where’s the confusion? Nothing to see here, folks. Just Multi-Worded Adam stroking his Ego………………….again! I like the 30 day challenges Matt, but this one is hardly a tough one. I want to see you go 30 days doing all the house work or 30 days without a mobile phone and only your landlines. You know-I just thought of something. Years ago, Lexmark came out with the cheapest usb drive on the market. The cool thing was, the drivers were embedded within the firmware. If all manufacturers did this, and also allowed you to easily update their drivers in the firmware, computers could run on a minimal OS. Maybe in the near future, remote API’s will replace our desire for local computing power and storage. Noppix runs great, loading into memory from a CD. If you could fit your OS (which ever it may be) on a usb drive, it would be cool if your personal settings could roam with you. I can not imagine a development environment for myself without any MS software. But the keyboard (Microsoft Natural Keyboard) you are using is very impressive and useful. I’ve bought one a few months ago when pain in my right arm has increased. Now it is getting better. By the way I can not imagine browsing the web without Google. Bing is getting better day by day but today it is far behind the results Google suggests. At some point you will need to login to windows until you are completely comfortable. You may also find that after some time you stick with ubuntu, the only problem is using dreamweaver on linux. 🙁 . I recently partitioned my computer so that on start up I can login through linux or windows. I recommend this to all. Linux is pretty well hacker safe aswell. I agree the ability to carry your O/S on a flash drive would be a great advantage. It would also help protect you computer equipment from theft, not having to carry a bulky laptop. Switched to mac some years ago and I loved every minute since. The Imac is my favourite desktop ever. Just bought a netbook and had to go back to XP and I’m ok with it, it does the job. Would love to try Ubuntu ! Could you please tell me, if Googlers use IE 6 in a xp machine of 1024×768 resolution to check websites? That’s what can I see in my log reports. It must be something in the air this fall. I just swapped out my Windows for Ubuntu also. And, particularly given my low-end hardware, it’s made a world of difference so far. Some things are taking some adjustment, but by and large, I love it. Enjoy! It’s an interesting challenge… and you don’t really know until you try it out. Personally I use a mix of MS and Ubuntu OSes. Is there any plan for an update on your experience to date, or will you wait until the 30 days are up? Half way point. How’s it going? I have been ‘trying’ Linux [and more recently Ubuntu] for years. In the earlier years, certain printers or software would be missed; Which kinda sent me back each time to MS, but more and more – everything works in Ubuntu! I have Linux Mint on my old Dell Laptop [which is a derivative of Ubuntu] – and that works G-r-e-a-t ! I’m unnerved by your suggestion to not use Microsoft software. I understand Google and Microsoft compete in several areas but you have to understand that Google has customers that enjoy using BOTH Microsoft and Google products. I love using Google as my default search engine and my free personal email service. I love using Microsoft Outlook and Excel. I love both companies. But when one takes a shot at another, I get turned off. In fact, I use a MAC and a PC in my office and I LOVE APPLE, too! The message is, I enjoy using the services of competitive companies such as Microsoft, Google and Apple. Bashing one another is a turn off. Ubuntu is the way to go forward i think it will eventually take over as it is more suited to the taste of the users rather than the taste of what microsoft think people want to see. Interesting month to try, with Win 7 coming out. Did you realize that when you first decided on this challenge? My desktop machine is an iMAC. When I wanted a new laptop, I refused to pay what they were asking and bought one with Vista. It ran like a dead snail. Absolutely hated it and barely used it for about 2 months. One thing it did do though was connect to the MAC and to my network drive. I got windows 7 when it was released and now the laptop is faster but it doesn’t connect to anything! I raised a ticket with Microsoft support and after 3 days I got a reply from some outsource company. “Due to the technical nature of the query, we can’t answer it”. Nice. Microsoft are masters of putting things out half assed and never getting them to work properly. I’m sure I could learn to live without the few windows only programs that I use. On the MAC, I just do what I have to do and don’t think about the operating system. I’ve tried it several times, but i guess ‘its impossible’. Have you ever played PC games? Well if you are not using Ms Windows then u’r scr*w*d.
Try google for an app download (e.g. doc to pdf converter), what search results do you get? Go through the first 1million search results, can you find any Ubuntu/linux/unix or Mac app? And finally there is no other office software even close to Ms Office. Last time I got fedup of Ms I installed Ubuntu 9.04 and went without Ms software for more than 3 months but then Modern Warfare 2 was released and games like these only come out for Windows, so I had to return. Sohrab: You picked the worst possible choice for an application to Google for. Users of most Linux distributions will not have to search for that, we just open the file in OpenOffice and Export it as a PDF. It’s been a while, did it work for you? I am really impressed with Open Office that I have been trying. There are some annoyances but that is always the case when you come from a world of Microsoft. Open office sadly jsut looks like office from about 5 years ago, it is a really good product but without the polish which I think is where a lot of money is spent. I find it funny that people always talk about software they have on Windows that they wouldn’t have on Linux or OS X and how that’s what stops them. I moved to Linux about 2 years ago and I have suffered only twice when it comes to missing software; one was being able to play Fallout 2 (try running that on 64 bit Linux; it’s no picnic) and a 6800 emulator I had to use for university assignments. Apart from those things, which I didn’t consider any great loss, I haven’t missed Windows at all. I find Open Office fully featured, and the operating system provides a way for me to fix my problems, rather than the old “reformat or restart” model that many Windows users profess as the best thing ever. I’d be interested to see what kinds of software people were talking about specifically when they say there’s a great downfall. Great, great move Matt. Now, if only we could get everyone to make the switch from Microsoft… the world would be a much better place! Open Source + Open Office + Google Docs = Everything you need! I just tried out this challenge and I made it -well,… almost. For all my personal use I lived on Opens Source but for my college work, I had little choice. Some of the proprietary software I use has Windows only versions. To counter this however, I used only the software and spent minimum amount of time doing stuff on Windows. It was a fantastic experience and I have credited you as an inspiration in my report on the challenge.